Hard-fought win for ‘Baggies Bomber’ in super-middleweight debut. In his first fight at super-middleweight, former British and Commonwealth middleweight champion Tommy Langford (21-3) was made to work hard for his points win against Frenchman Baptiste Castegnaro (8-16) on March 9 at the Walsall Town Hall on a BCB Promotions event. Langford didn’t have it all his own way against the tough 28-year-old from southwest France with the six-round super-middleweight contest scored at 58-56 to the 29-year-old from Birmingham. Langford started off on the front foot and took the fight to the Frenchman, who has previously shared the ring with Olympic bronze medalist Joshua Buatsi. The West Brom FC fan, born and raised in North Devon, was dominant behind his double jab and landed a neat left to the body midway through the first round. Castegnaro did manage to have some success in the opener and when he landed cleanly, it visibly incentivised him to follow up, forcing the home fighter backwards. The French fighter did manage to ruffle Langford’s feathers a little bit, who took a tiny tumble at the end of the opener, but was ruled as a slip. Langford started the second stanza behind a stiff jab, backing Castegnaro up. They were soon tangled up in the centre of the ring until Castegnaro forced Tommy back to the ropes without managing to land anything at all as Langford ducked and weaved and soon answered with a one-two to the head. It was a clean, controlled round for Langford on the scorecards, as he began to lose his nerves and find his rhythm. Langford landed a peach of a left hook as the pair traded in the centre of the ring in the third, but Castegnaro managed to score back with one of his own seconds later. This round was contested in close quarters for the first time in the fight as Castegnaro held his feet a bit longer and there was success for both parties during the three minutes of action. Despite Langford producing the more dominant and aggressive display, Castegnaro enjoyed spells of success and produced a late flurry seconds before the end of the fourth segment. The fifth round was far more controlled, as Tommy stalked his opponent, who occupied all four corners of the ring for the duration of the round as he attempted to move away from danger. Langford unloaded when he trapped Castegnaro in his home corner and a left hook to the body followed by another to the head sent the Frenchman backpedaling across the ring. Castegnaro came out swinging in the final round and the pair finished with a firefight in the middle of the ring. The official scored it four rounds for Langford and two for the visitor. Langford commented post-fight, “Back to winning ways! I was a little jittery to begin with, I have to admit, but I soon warmed up. To be completely honest, I was actually very nervous and a bit tentative early on, which resulted in a hesitant first few rounds. “It was to be expected after the lay off and moving up a weight division, but I warmed into it and started to box well and by the end I was really dominating and hurting my opponent, especially with the left hook. “It was good to get the experience at 168lbs against a fully-fledged super-middleweight who has fought two of the best light-heavyweights in the country in Olympian Joshua Buatsi and English champion Liam Conroy. “He was a strong, durable opponent, so the experience will be invaluable as I push on to bigger fights. Many others would have had a more conventional or less dangerous opponent for their first step up to a new weight, and, if I’m going to be completely honest, I probably would have liked to have had an easier opponent, but now the job’s done and I’ve come through well, I’m very happy. The ‘Baggies Bomber’, named so by his huge following of West Bromwich Albion FC fans, has already declared his intentions to become a two-weight British or Commonwealth champion. Zach Parker from nearby Swadlincote is the current British super-middleweight titlist and world title challenger Rocky Fielding last held the Commonwealth strap. The BCB Promotions ‘Pride of the Midlands’ event also featured Midlands Area middleweight champion Tyler Denny (10-1-2) who earned a shutout points win over six-rounds and has plans to fight for bigger titles in 2019. 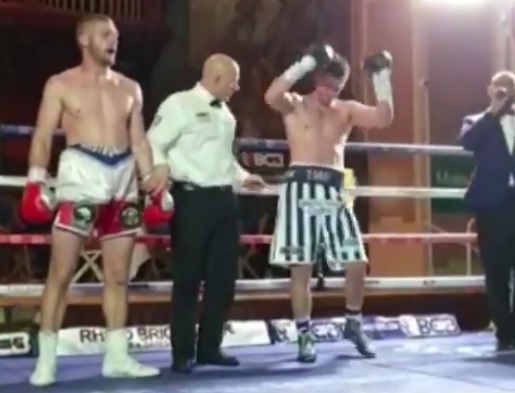 Ricky Hatton-trained welterweight Conah Walker (4-0) remained unbeaten as he scored his second KO and unbeaten lightweight Connor Lee Jones moved up to 3-0 with a points win. Wolves welterweight Kirstie Bavington (2-0-1) scored her first stoppage win in a very one-sided fight. The Rapsody Tender Cabin is a variant of the current Rapsody Tender, but equipped with a cabin and a double berth of more than 2 meter. The Tender Cabin is a derivative of the Rapsody Tender. Fitted with a practical cabin with spacious double bed, it offers a comfortable place to stay on the dayboat. The large 1 by 1 metre hatch provides easy access to the cabin. When closed, the teak deck with herringbone structure serves as sunbed. The engine cover conceals a Volvo Penta diesel engine of 220 hp. The engine power ranges from 150 up to 300 hp. The Tender Cabin is a centre console boat with classic lines, emphasised by a tumblehome stern and flared bow. The integrated refrigerators underline her practical comfort, as does a fitted toilet located in the cockpit. The GRP construction of the V-hull makes for a very smooth sailing experience. Combined with a strong Volvo Penta diesel engine a top speed of 34 knots is achieved. 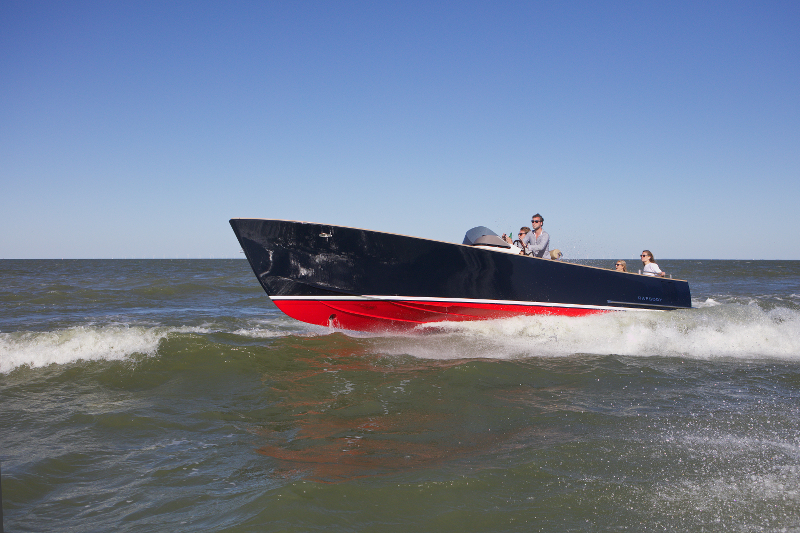 The Rapsody Tender is equally at home on both lakes and sea. Weight and width allow you to transport her to your favourite location. The Rapsody Tender Cabin will make its world premiere at Dusseldorf Boatshow in hall 17 at stand C56. “This boat is versatile; it is a day-boat, but you always have the possibility to stay over for the night”. “Last but not least there are two fridges on board to help you keep your head cool”. “The Rapsody is defined by sheer stylishness and speed with its sleek hull and low profile cabin”. “The interior of the Rapsody Tender is practical throughout. The helm is fitted with a spacious toilet. Both bow and stern have room for sun-beds and of course the large double berth inside”. “Within 2 minutes you can be out on the water to enjoy the boat. The same applies when you get back, because you don’t have to struggle with a tent”. “The hull was developed to be swift, as well as safe and to generate no spray. Combined with a strong Volvo Penta diesel engine this makes for a maximum speed of 34 knots”. Rapsody Yachts is a high end yacht manufacturer based in Muiderzand, the Netherlands. Rapsody Yachts finds its origins in the yacht restoration, where exclusive and classic shipyard boats from the Netherlands and Scandinavia were renovated. In 1999, as a response to a growing demand for state-of-art motor yachts in the top segments, Rapsody Yachts started building new classically contoured, high-speed motor yachts. Nowadays more than 350 Rapsody’s are sailing along the coastlines of Western-Europe and the Mediterranean. A brand new funding scheme is set to aid the retention of adult male teams within grassroots football clubs. 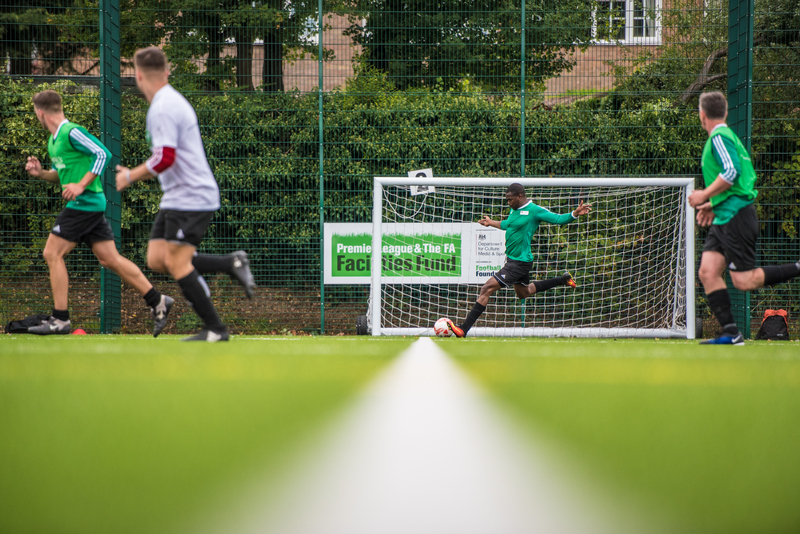 The £1 million fund has been created to boost football’s traditional format following a recent decrease in the number of adult male FA-affiliated grassroots league teams. The application window for Retain the Game is now open and closes on Wednesday 30 May. Clubs seeking more information on the programme should either contact their local County FA or visit www.footballfoundation.org.uk/retain-the-game. If you carry out Google Image searches on a regular basis, you may have noticed a rather significant change that’s crept into the equation over the past few weeks. When searching for images, like for example sports images, of any kind, the ‘View Image’ button is now notable by its absence. If this doesn’t mean a great deal to you, it probably won’t affect you, either. The long and short of it is that with the removal of the ‘View Image’ button, it will no longer be possible to click on sports images in a Google Image search and have them pop up in a separate window in their full-size form. Instead, you’ll need to click through to the website from which the image was sourced. The question being – why has Google gone ahead and removed a button used by millions of people worldwide, every single day? In a nutshell, it all comes down to copyright protection and the potential for infringement. Getty Images in particular has been known to speak out quite vocally over recent years, with regard to how easy Google makes it for people to steal other people’s photography and imagery. Simply by clicking the ‘View Image’ button, web users were able to copy or download pretty much any image they came across, irrespective of whether they had the owner’s authorisation to do so. The intention of Google seems to be two-fold in nature. For one thing, removing the button will make it at least slightly less straightforward for people to illegally download, distribute and use images that don’t belong to them. In addition, those looking to access said images will have no choice but to click through to the website of the rightful owner. Something that in turn could make a big difference to the incoming traffic volumes of the website in question. Unsurprisingly, praise and criticism have been equally strong on both sides of the fence. While many have saluted Google for taking such affirmative action, others have gone no less than ballistic. As far as advocates of the move are concerned, the whole thing is something of a no-brainer. If you want to access the photography and imagery of any given business or website, you should at least have to pay the website a visit. Google can show you the way, but it’s only fair that you actually head over to the website itself. Not only this, but anything that makes it possible to steal the intellectual property of other people cannot realistically be considered a good thing. 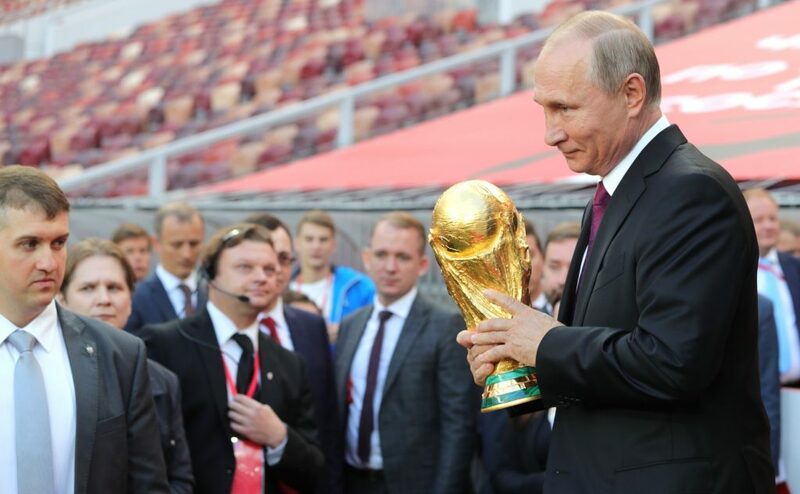 After all, if you’re going to invest heavily in the production of outstanding sports images, you don’t want them being stolen and used without your permission. So as far as many publishers are concerned, the move is not only welcome, it’s also long overdue. As for those on a more critical the side of the fence, hundreds have already taken to social media to vent their frustrations at Google. Some of whom claim to be fundamentally reliant on the ‘View Image’ button and claim to have only ever used it to access and procure royalty-free images that anyone can use. To them, their lives have simply been made more complicated for no good reason. Particularly given the fact that there is still a quick and easy way to get around the removal of the button. When you right click it, you can select “open image in new tab” or “view image” (or whatever your browser’s equivalent option is) and there it is. So while it may be noble and proactive of Google to make efforts to prevent copyright infringement, they haven’t exactly taken things to extremes or addressed the problem in its entirety. Still, it pretty much goes without saying that Google isn’t in the habit of backtracking on these kinds of updates and amendments. Irrespective of personal opinions, therefore, it seems the ‘View Image’ button really is gone for good. 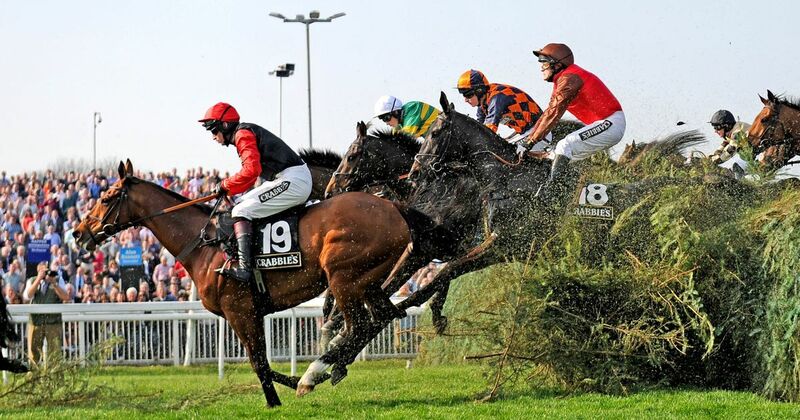 The Grand National – Part of British Culture! My personal memories of horse racing go back to the 1980s, where we would visit my elderly grandfather in the West Heath area of Birmingham. Jim was originally from Dublin Ireland and was an avid horse racing fan. He literally lived his life for his main hobby which was nipping down to the bookies to place his bets on the neds each week – if you got in the way of the TV while the racing was on, you’d better watch out! The highlight of his horse racing year, was The Grand National. The Grand National is known by many as a National Hunt horse race. The event is held each year at the infamous Aintree Racecourse in Liverpool, England. These days instead of having to waste time standing in the betting shop, there are online betting sites where people can place their bets online, much easier. The very first event took place back in 1839, and the present day race is a handicap steeplechase which covers 4 miles 514 yards (6.907 km). There are 30 fences for the horses to leap and it takes place over two laps. Not many people realise, that The Grand National is the the most valuable jump race in Europe. The prize fund was a staggering £1 million in 2017. As demonstrated by Jim’s passion, this race is an important part of British culture. It draws an audience from many backgrounds and ages, with the emphasis on the betting, it’s a chance for everyone to place a bet and win or lose. Some people, including animal rights groups resent the Grand National because the course has much larger fences than those on other conventional National Hunt tracks. Many of these, particularly Becher’s Brook, The Chair and the Canal Turn, have become famous in their own right and, combined with the distance of the event, create what has been called “the ultimate test of horse and rider”. A mind boggling 500 to 600 million people watch the Grand National in over 140 countries worldwide each year and it has also been broadcast on the radio since 1927. Again the BBC held exclusive rights over broadcast on radio until 2013, and Talksport now holds radio commentary rights as well. In 2017, The Grand National was won by One For Arthur, ridden by jockey Derek Fox for trainer Lucinda Russell. This year’s event will take place on 12 April 2018 and finish on 14 April 2018. The race and accompanying festival are currently sponsored by Randox Health. If my grandad Jim was still alive today, he’d no doubt be shouting at the TV like a mad man as the horses jumped the fences. However, he too used to admit the fences were too high with many notable casualties. This does not deter people watching or placing their bets. Article by Simon Lucas for Blog About Sport UK. Is the future of sports online? By 2020 it is expected that around 11bn hours will be spent by fans watching esports, with more than 70m enthusiasts watching major finals through online streaming platforms. This is more than the MLB and NBA finals. With the question of whether the next generation of sports fans dream of being behind a controller, or out on the pitch – Betway have compared the two to see where the future of sports lies. Recent survey revealed that more young men now prefer to watch esports than traditional sports (esports being rated as their second most preferred media source, only behind movies). Esports is set to eclipse traditional sports revenue by 2020– with esports revenue expected to hit £1.2bn. Figures show that from the 10 highest earning competitors from UFC and esports, gamers dominate when it comes to average yearly earnings. The recent prize pool of $17.5m from Dota 2: The International 2017 event already far outweighs the combined prize pool of other major sporting events, such as Tour de France, Cricket World Cup and The Open. Do you think this would be interesting for your readers? Do you know your hollow from your radius? What about the difference between rockering and a forward lie? Do you know how to become a set of ‘wheels’, ie a fast player? An inspirational video featuring US ice hockey player Ryan Gunderson has been issued by non-profit organisation World Steel to mark the Winter Olympics in South Korea this month (9-25 February) . In it, Ryan, who will represent the US at the Games, describes how his love of hockey began after being introduced to skating as a young child. Ryan, who plays professionally for Brynäs IF, one of Sweden’s best ice hockey teams, also talks about his interest in the technology of blade innovation, underlining how the steel manufacturing process is vital to creating that all-important competitive advantage. The steel used in the team’s hockey boots is manufactured via a partnership between Canadian steel ice hockey manufacturers Bauer, and Sandvik. The video also contains a compelling explanation of how blades for ice hockey boots are individually shaped for play.